Chelsea and Chris’ garden Tampa Bay wedding featured a romantic, outdoor ceremony with rustic elements to bring together their bright and airy, spring time theme. 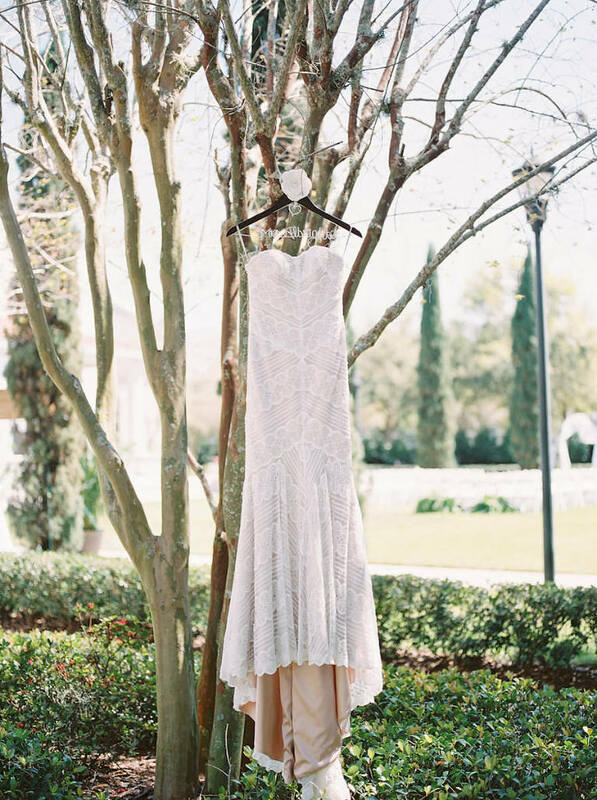 The St. Petersburg couple searched for a peaceful and serene Tampa Bay wedding venue with a beautiful outdoor space and indoor rain backup options. Looking back, the bride shared that the cherished memory from her wedding day was locking eyes with her groom during the start of the ceremony. 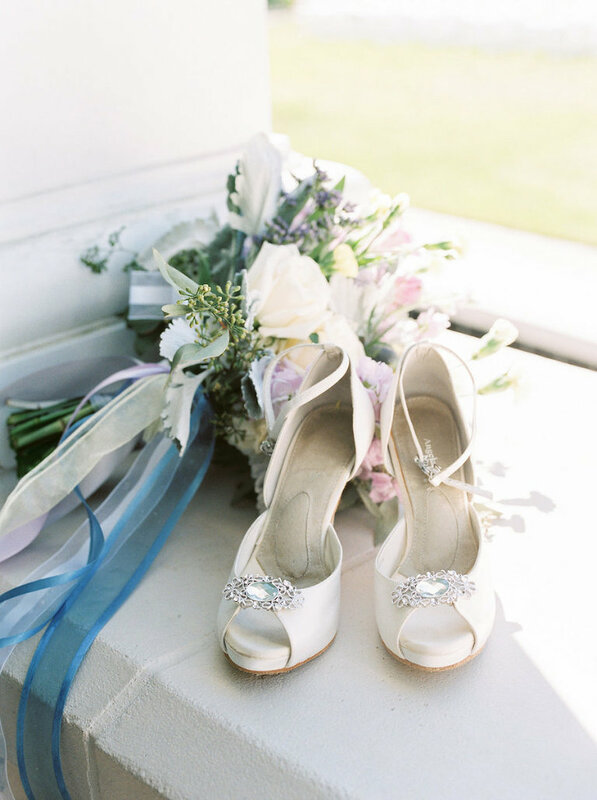 “The most memorable moment was seeing my husband waiting for me at the end of the aisle. We spent so much time in getting ready preparing for this moment and worked so hard to get there. After waiting seven years for him to ask me to be his best friend for life, I couldn’t wait for him to see me all dolled up in the most gorgeous gown I’ll ever wear and all for him. It was magical,” the bride reminisced. 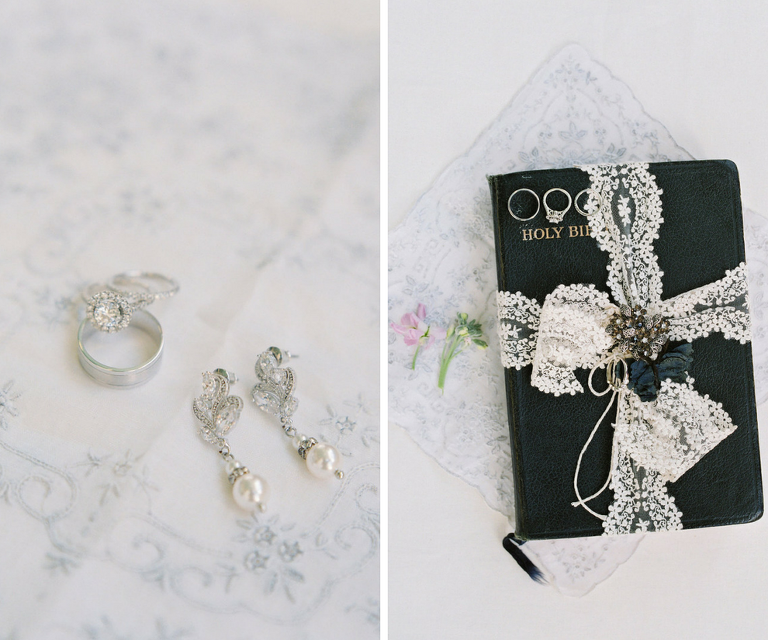 Spring-y and very romantic with touches of rustic pieces. 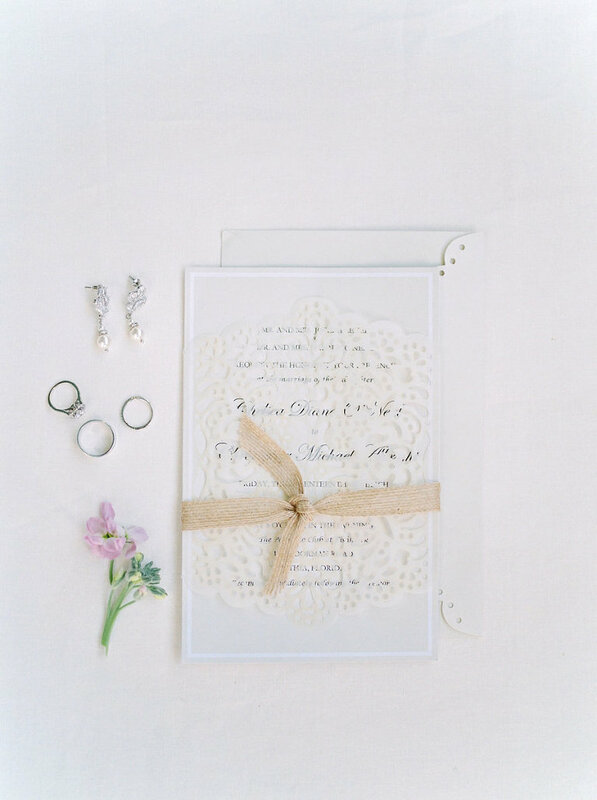 I chose this style because our wedding date we chose was in spring, and I wanted it to be full of life, with a “bright and airy” feel. Secondly, I saw color combinations that I really gravitated towards, and I had a good feeling about it, as I could envision our special day with those colors. Yellow, lilac (different shades of purple) light blue and cream with hints of earthy greens. We chose them because it went best with the time of year and the weather, spring! I added bits of blue and yellow to make it a little less girl-y for my husband, so it wasn’t all purples and creams. I also added pops of color which came together better than I ever imagined! Chris and I had planned to take the day off and spend it with one another a week before he popped the question. We decided to pack a small picnic and go to Bok Towers. I literally had no suspicions or indications that he was going to pop the question. He totally kept his cool the whole time. I gave him a tour of the place and showed him some of the historical parts, scenic parts, and then my most favorite part of the park and where ‘it” happened. I had talked to him about this particular spot before saying it is my most treasured place to visit in the park. No one really knows about it, it’s away from the walkways and me being the little adventurer, I had stumbled upon it once before and knew one day I wanted to get married right in front of this exact spot. Once we got to my favorite spot, I stopped to show him the breathtaking view. We stared out at the estate overlooking the water and smiled at one another; in that moment it was pure bliss. We shared a tender kiss, as he leaned in he whispered in my ear, “You know I want to spend the rest of my life with you. You mean so much to me.” I was in utter shock, stunned, speechless. Chris told me I kept saying or sobbing, “Right here?! Right now? !” Not one of our family members or closest friends knew for several hours, and we just basked in our glory and talked about it while we enjoyed our picnic lunch under a huge old shady oak tree. There is so much to look for in a venue as that is one of the most important aspects to a wedding! We looked for a place that we thought we could see us getting married at of course, but a place our friends and family would have a good time also. We wanted a venue to have a beautiful outdoor ceremony option, as we both are very outdoors-y people, especially me. We wanted it to be peaceful and serene. The venue also needed to be able to house a lot of people, as we come from big families. We wanted the reception to be indoors, with the option of having the ceremony indoors too if the weather didn’t permit. We chose The Palmetto Club mainly because we could vision our special day at the venue. It had the perfect “feel” to it: wide open windows, and the outside is well-kept with beautiful with trees. They also offer an arch for their bride and groom to use in their ceremony. Our wedding came together with the help of family, friends, and of course the staff at the Palmetto Club. They’re very attentive and flexible to work with and made it so Chris an I wouldn’t have to lift a finger so we could just enjoy and soak it all in. This question is tough because I feel like as the bride there is so much pressure between planning and picking the right colors/theme to best match you and your husband so that everything is perfect. I asked the same questions to family and friends that have been there before but the answer was all the same and at the time I didn’t TRULY understand it until now after everything was done. But it is true, I would have to say to literally just enjoy it as much as you can. Enjoy the heck out of it and in every aspect. The happy tears and even the stress, because trust when people tell you, that it goes by in a blink of an eye. The only thing you’ll have left is memories and photos. Having all those close and dear to you in one place at one time in your lives will forever be the best gift you’ll receive on your wedding day besides saying “I do” and getting to spend forever with your best friend.